Does it have to be Zucchini for Z? Yes, of course. So here I am with my final recipe for this A-Z lunch box series – Zucchini Rice. 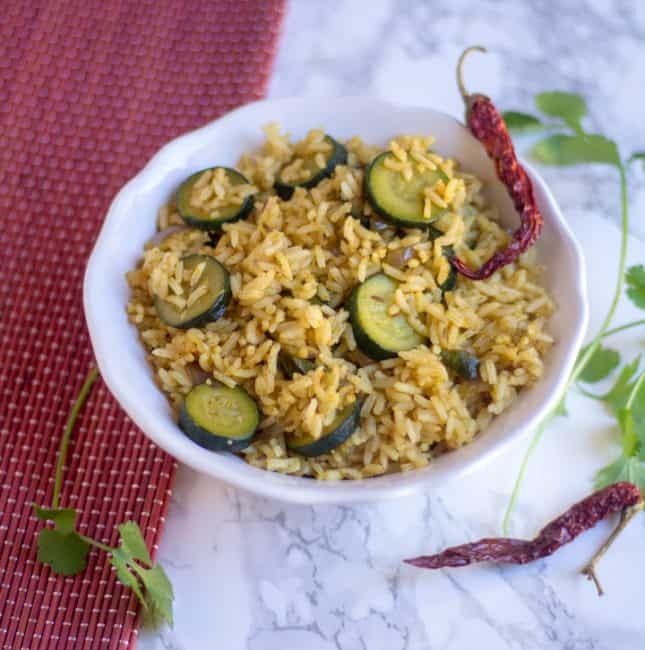 A delicious rice recipe prepared with the versatile vegetable zucchini with a tad bit of spiciness and loads of flavor coming from vaangi baath powder, garam masala, and sambar powder. 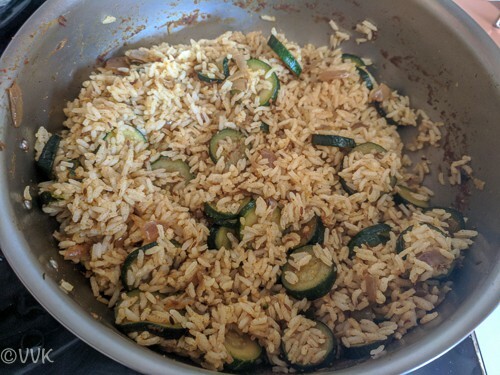 Let’s learn how to make this simple and quick Zucchini rice or Zucchini baath with detailed step by step pictures. Like sambar powder, rasam powder and garam masala, vaangi baath powder has become quintessential spice mix in my kitchen. I use it for the bisi bele baath, for any vegetable rice like ridgegourd rice, brinjal rice and for dry curries as well. I would recommend you all to stock it up. It comes in handy for many recipes, especially like this vegetable-based baath or variety rice. 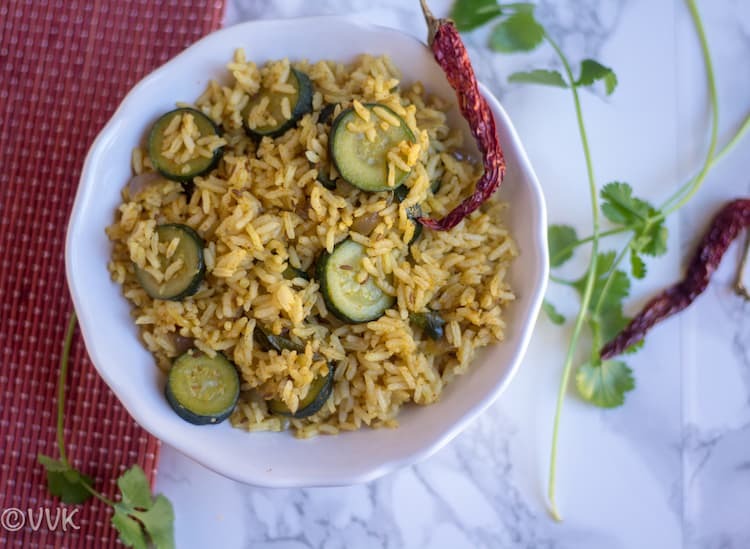 This zucchini rice recipe is very similar to ridgegourd rice. 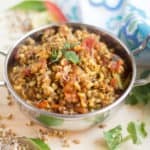 Now that kiddo likes spice, I include sambar powder also in these variety rice recipes. Also, instead of chana dal and urad dal tempering, I went with cumin seed tempering. But there is no hard and fast rule and I always go with my intuition for the tempering. I hope you all enjoyed this A to Z kids friendly lunch box series. I will share more about my participation experience on my round-up post. I will be re-doing few of my old blog lunch box recipes as well in the coming months. So stay tuned and you can follow me either on Pinterest or Facebook or sign up for my newsletter and get all these updates. Wash and cut the zucchini into small rounds. I did not peel the skin as it was tender. 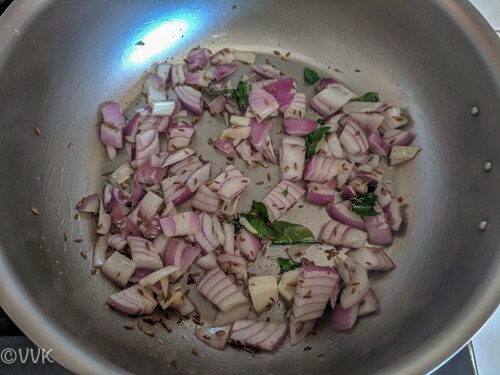 Chop the onion and cilantro and set aside. Cook the rice in your preferred way and allow it to cool before. 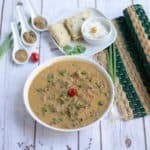 I used sona masoori rice for this recipe. When the oil is hot, add the cumin seeds and hing. As they start to splutter, add the chopped onions, curry leaves and cook until they turn translucent. 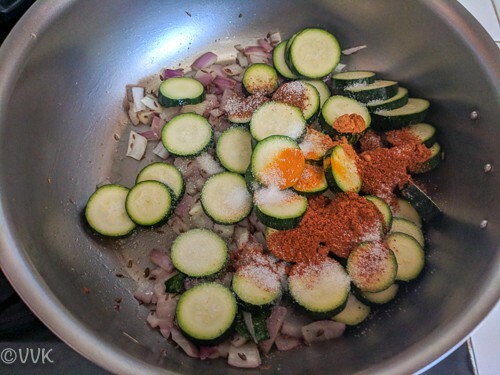 Then add the chopped zucchini, salt, vaangi bhath powder, sambar powder, turmeric powder, and garam masala. Sprinkle two tbsps of water and mix. 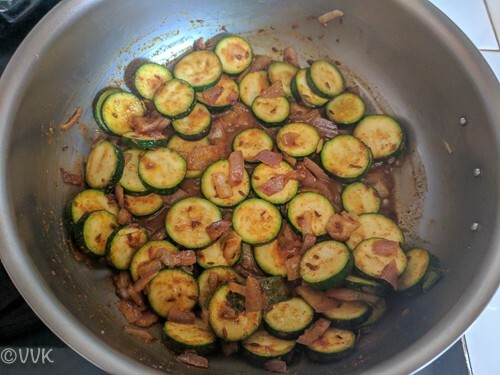 Cover and cook this for 5 minutes and remove the lid and cook until the water evaporates and the zucchinis are softer and tender. Turn off the heat and add the cooked rice and mix thoroughly. That’s it. Zucchini rice is ready. Garnish it with cilantro and serve hot with raita. You can prepare similar rice with chow-chow, ridgegourd, cabbage, bell peppers by replace zucchini or including along with zucchini. I went with sona masoori rice. But you can use millets or quinoa or basmati or brown basmati. Do not overcook the vegetables and make it mushy. That's it. Zucchini rice is ready. Garnish it with cilantro and serve hot with raita. Adjust the salt and spice as per your preference. I went with sona masoori rice. But you can use millets or quinoa or basmati or brown basmati. Vaangi bhath powder maust have taken this dish to another level.Its always good to stock up on various masala powders to liven up a simple / boring meal, right! Loved all the dishes in this series Srividhya. Very true. Vaangi bhath is so versatile too. Omg semma tempting rice there vidhya :) looks so delicious and paathale pasikudhu .. I totally enjoyed your lunch box series vidhya..Did an excellent job, you rocked !! 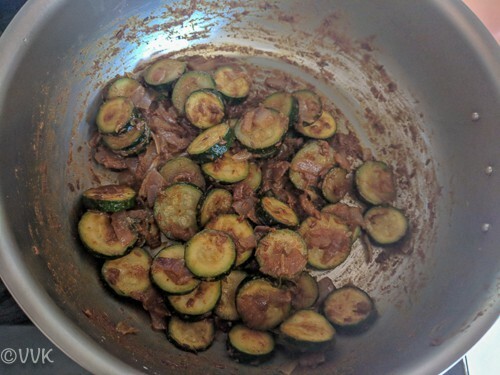 That is an interesting rice recipe using zucchini. Loved your lunch box series, Vidya. The dishes are delicious for any meal of the day, even for adults. What a great idea to use zucchini with rice. 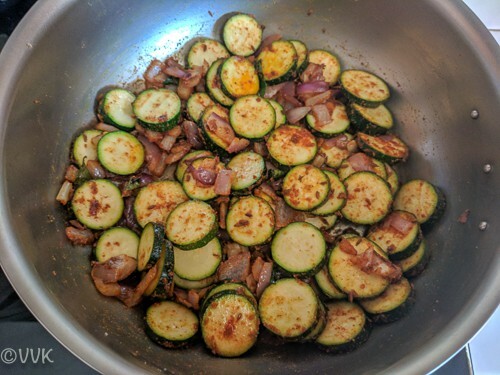 I am growing zucchini in our backyard and this recipe has come at the right time. 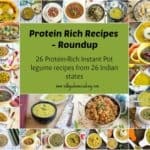 Loved your whole series Srividhya and have bookmarked many recipes to try! 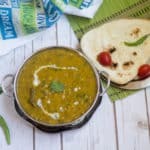 Wow, Srividhya, that rice does look like a spicy vangi bath one!..and I love the fact that we can so easily Indianize this vegetable and use it for our atoz series..very nice!..I really enjoyed your kids lunch box and a big applause to both you and your son for getting us this beautiful series. This is one flavorful rice and using vaangi bhaat masala in various dishes is a good idea. I enjoyed your lunch box ideas. Though I don’t have to pack lunch boxes but they are great quick lunch ideas. I can have rice in my lunch box every day and in any form. 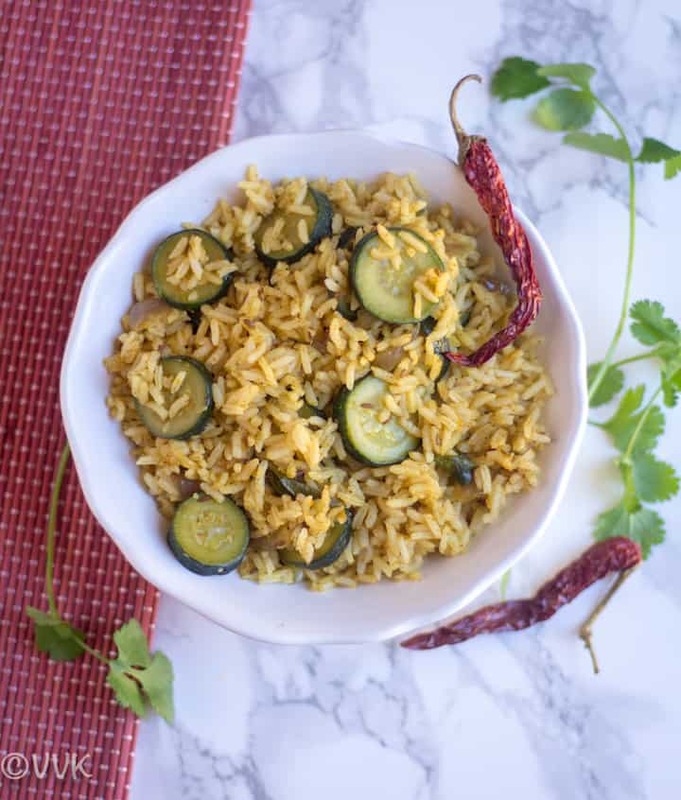 Your idea of using zucchini and making the rice our desi way is quite an interesting fusion. Loved all your lunchbox recipes this marathon. Never thought zucchini can be used in a rice dish. Thanks for the idea. It sounds delicious with all the spice powders you added. Good choice for the letter Z.
Srividhya, the complete lunch box series has been a beautiful one where you have posted perfect lunch boxes..all mothers would be so happy to come to your space for reference. I like the way you have added some fruit too , making it a complete meal. kudos to you and kudos to your kid..he is a lovely kid , without any fuss !! ..a big hug to him. I must say you have a super hero kid !…kids hardly eat veggies, kudos to him for being such a good boy. the zucchini rice looks very flavorful and using left over rice is a quick , breezy way to make these. Yeah, touchwood and so far so good. He doesn’t hesitate to try and that makes me try different recipes. :-) Thanks a lot Vaishali. 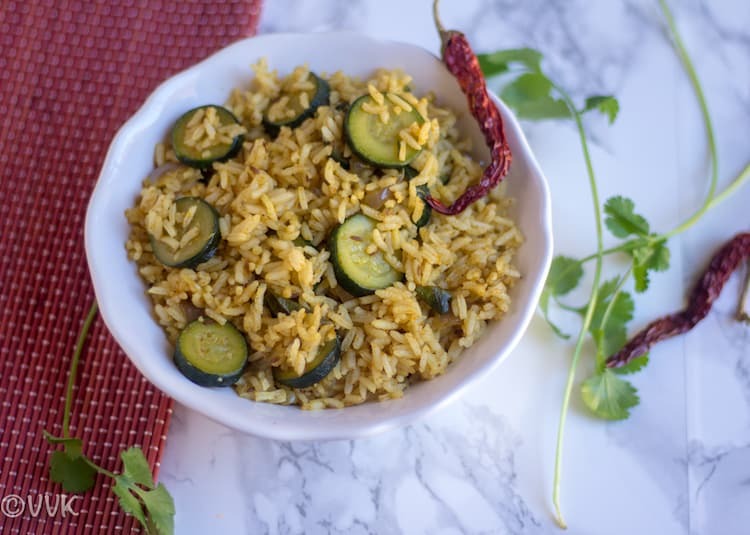 This zucchini rice recipe sounds super delicious, will definitely try it out soon! 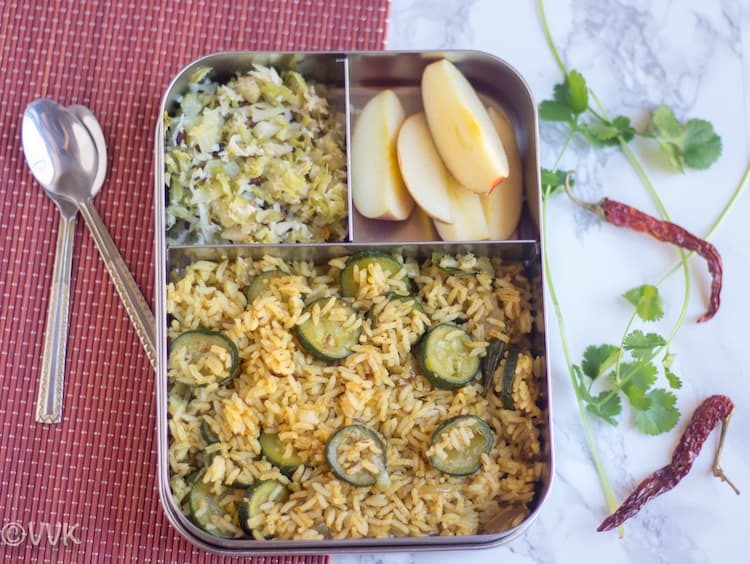 This zucchini rice recipe sounds super delicious, innovative as well as easy for day to day lunchbox idea. We love zucchini and this rice sounds absolutely delicious. It was lot of fun having you as a co-marathoner. Thanks for loads of lunch box ideas. Zucchini, that’s what comes to my mind when i think of the recipe start with letter “Z” :-) . Zucchini rice sounds simple and delicious. Perfect one for lunch box. 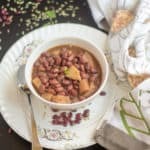 You have shared amazing 26 lunch box recipe in this marathon and enjoyed reading each one of them. Kudos Vidhya!!! Thanks, Sandhiya. Zucchini is the default for Z na. 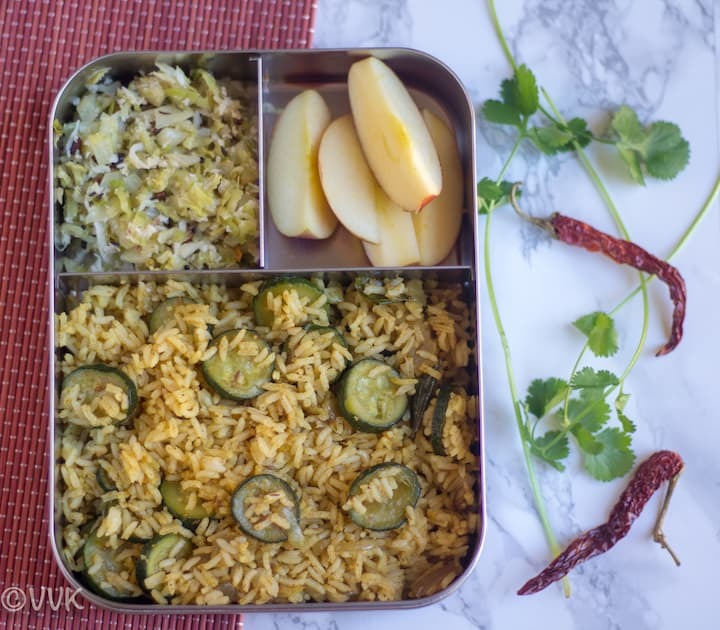 Wow, indian style zucchini rice, a prefect lunchbox idea Vidhya, what a wonderful way to sneak this zero calorie vegetable. Super delicious dish. Enjoyed thoroughly your 26 kid’s lunch box ideas Vidhya, you have done an incredible job yaar. Kudos to you.